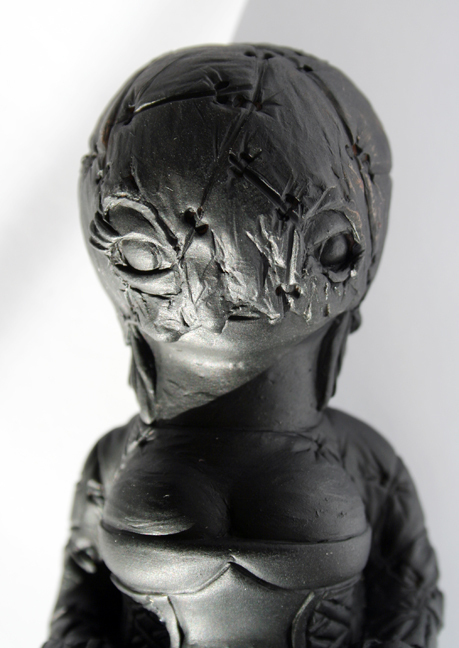 Debuting this Friday, August 2, 2012 via the Max Toy web site is Lady Vengeance by artist / sculptor Jay222 ! It’s been a long road to finally get this figure done in soft vinyl in Japan. So as i looked at Jay’s work i thought he’d be able to pull off something different for Max Toys that we have not done to this point. 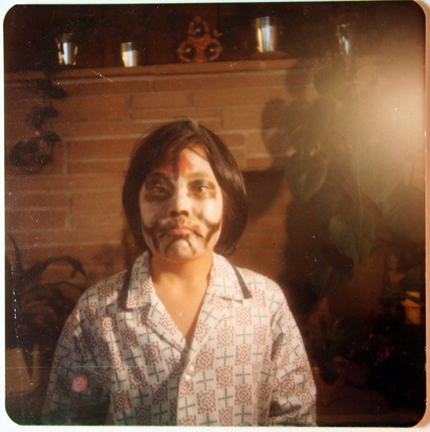 Jay’s idea was a creepy, zombie like girl and I was fully behind this. 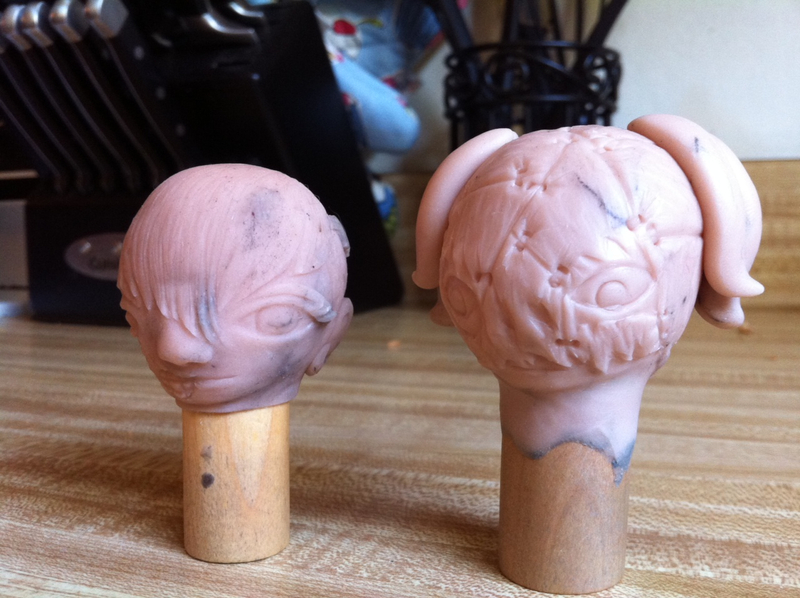 He started with these two head sculpts below … I liked both directions so he decided to proceed with both, so we could pick one when he was done. 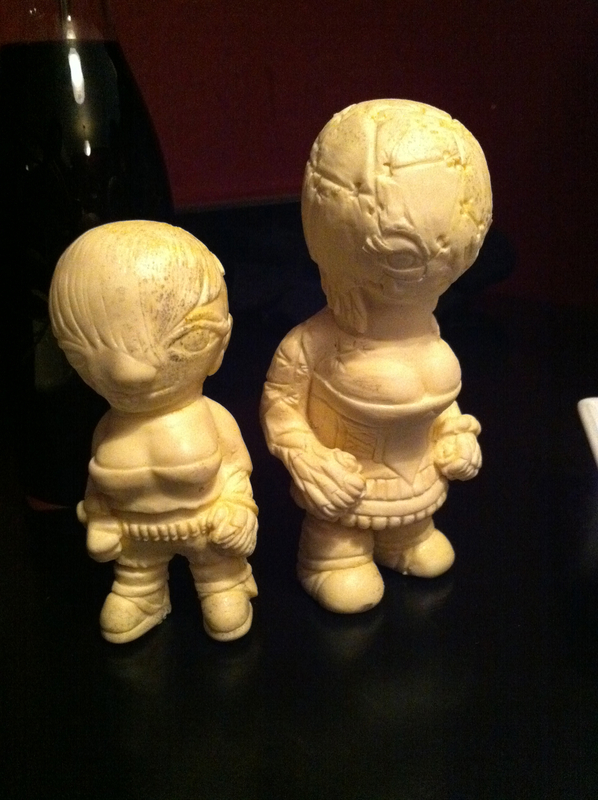 Jay finished up both figures and cast them in resin below. Between the two I was really liking the taller version with the skin mask on. And true to Jay’s talent, there are lots of great details all over the figure .. textures and surfaces … my only concern at this point was could his sculpt translate to soft vinyl ? Not every sculpture can be made directly into soft vinyl … there’s the part break downs and the iron molds are sometimes an issue with under cuts and areas where air bubbles can crop up. But despite my concerns I felt we should move forward and try to keep as much of Jay’s sculpture in as pure a form as possible. More views of the final sculpture … you can sense the different textures of cloth, leather, metal , hair … ! Jay had to make a cut at the neck, making two pieces for the wax to be made. This part was a bit tough, but he did it and I took these with me to Japan to hand over to sculptor Makino-san. Below, the final wax figure ( head and body ) by Makino-san of TTToys in Japan. This is what is given the iron molds factory. The factory will place the flange on the neck was well. 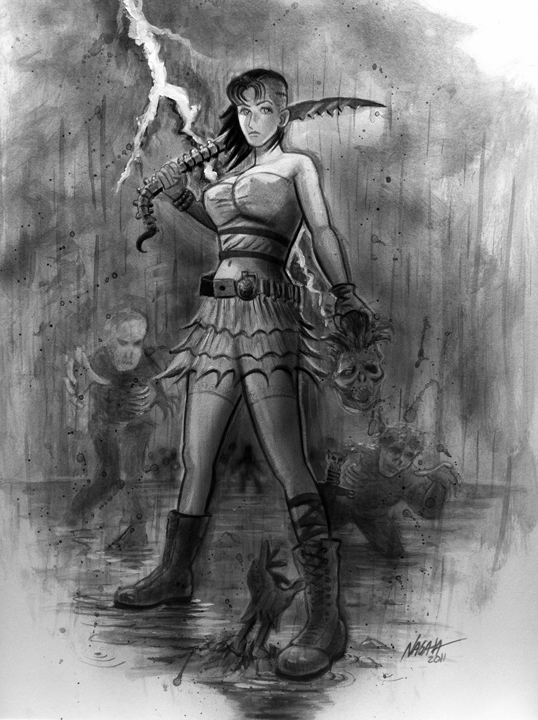 Above, Jay created this cool art and logo of Lady V .. you know your too old when you simply can not read this text .. haha .. but I liked it ! Using Jay’s direction to make the header look old and worn with some blood on it .. I proceed to make the header card. 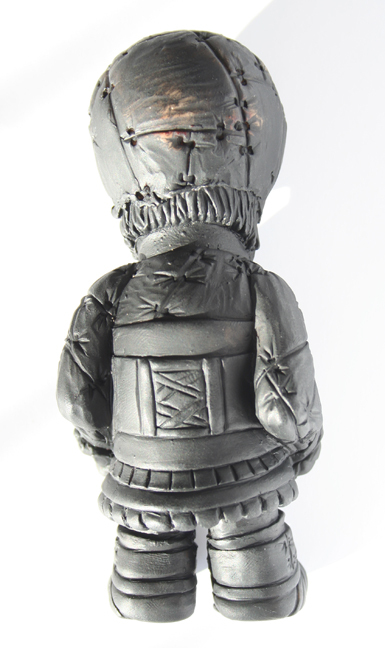 Finally, the finished soft vinyl figure of Lady Vengeance !!!! Standing 4.5 inches tall !!! Seeing a figure in vinyl form never gets old for me .. and as you hold it you realize that all the hard work, emails, shipping and meetings has resulted in this collectible figure in your hands ! Above: the figure bagged with header card .. not too bad 😉 So after months of hard work all around the figure will go on sale tomorrow. 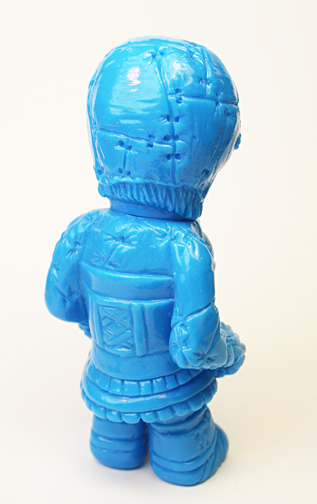 As with all of our figures the supplies are limited and sold on a first come, first served basis. Thanks for the support and I think you’ll like Lady Vengeance !!! 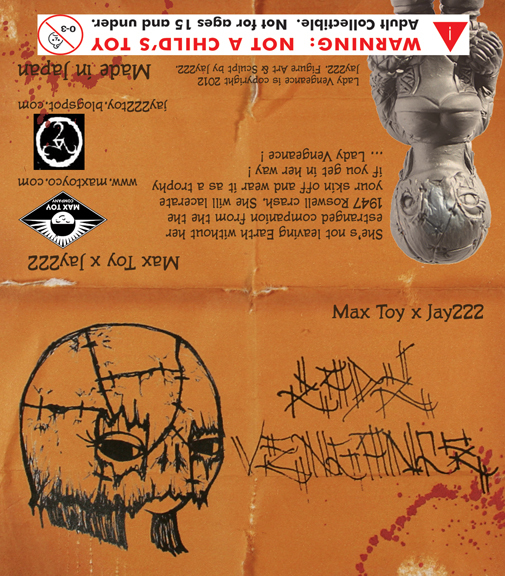 This entry was posted in art toys, collectibles, Japanese toys, mark nagata, Max Toy, Max Toy Company, soft vinyl and tagged collectible toy, horror, jay222, lady vengeance, soft vinyl. Bookmark the permalink.